There has never been such an easy backlinking tool to use. Right from the start everything is made as easy as possible and if you are new to SEO and backlinking you will only need to enter in 3 pieces of information to start generating backlinks and improving your search rankings. As any good search engine optimiser will tell you backlinks are the single biggest driving force for improving your search engine rankings. No Hands SEO will allow you to build backlinks while you are not even at your computer. You set it up once and let it run forever. No Hands SEO will take your keywords and find website relevant to them to build links from and then post to them automatically, this ensures that you are getting the best niche relevant backlinks possible. Once a link has been posted it will check that the link is there and if so it will automatically ping that new link so it gets indexed right away and you benefit from it that much quicker. This process can go on endlessly as No Hands SEO will actually look to find more keywords that are similar or related to the original keywords entered and then continue to use these to find more targets. Unlike other backlinking tools that rely on you to constantly feed them NHSEO is fully automated, you enter your profiles and let it work. You literally just press start! NHSEO is also capable of getting your website indexed within hours and can even crawl your website to promote all of your content not just the homepage. It is possibly the easiest backlinking tool but also is incredibly cusomisable so you can control almost every aspect if you like to tinker. 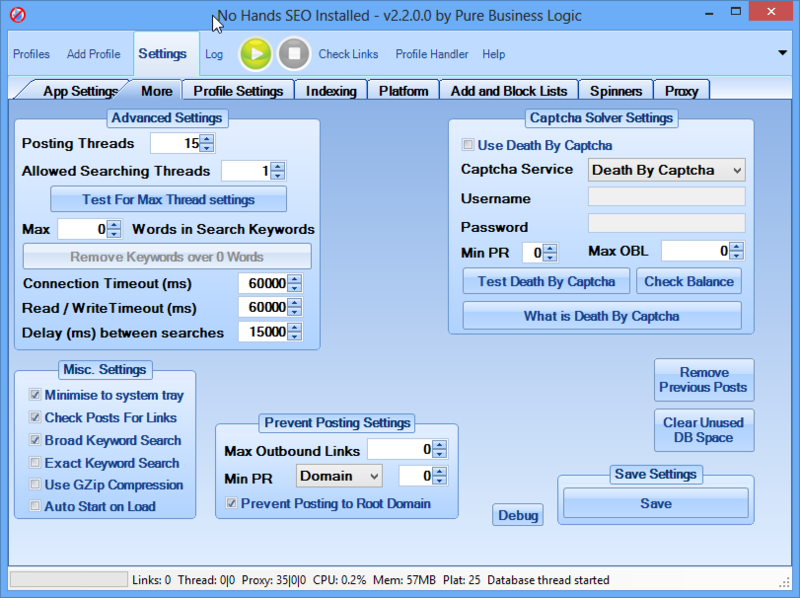 No Hands SEO was released mid 2011 and since then has had inumerable updates to make it a far more powerful tool than it was on release. When it was first released there were lots of reviewers stating first page Google was accomplished with just this tool, imagine how easy it is now with more than 4 years of extra development into it. Due to its continual updates and support NHSEO still is one of the premiere SEO backlinking tools. There are literally hundreds of positive reviews and comments about this tool. Post links to lots of different link platforms for unparalleled link variety. If you do not have your own proxies NHSEO will find them for you. Here you can handle everything with your profile including the anchor texts for your inner pages, how often to check for new pages, comment to be posted and so much more. Even though everything is fully automated and requires no baby-sitting there are so many settings that can be used to really customise the type of links you want to generate that No Hands SEO really is an incredibly powerful tool. Wow, great updates. With all platforms that you will add, this will be greatest automatic seo software! NHSEO does exactly what it says. It's the easiest SEO tool out there even a child can use it! There's no backlink tool out there like it. Put your website address, put the keywords you want to rank for, press play, done! No Hands SEO is the first real fully-automated promotion tool I have ever used. The idea is brilliant, you just need to input your site's URL and keywords, and the tool creates comments backlinks, trackbacks, indexing services backlinks and pings it all as advertised. 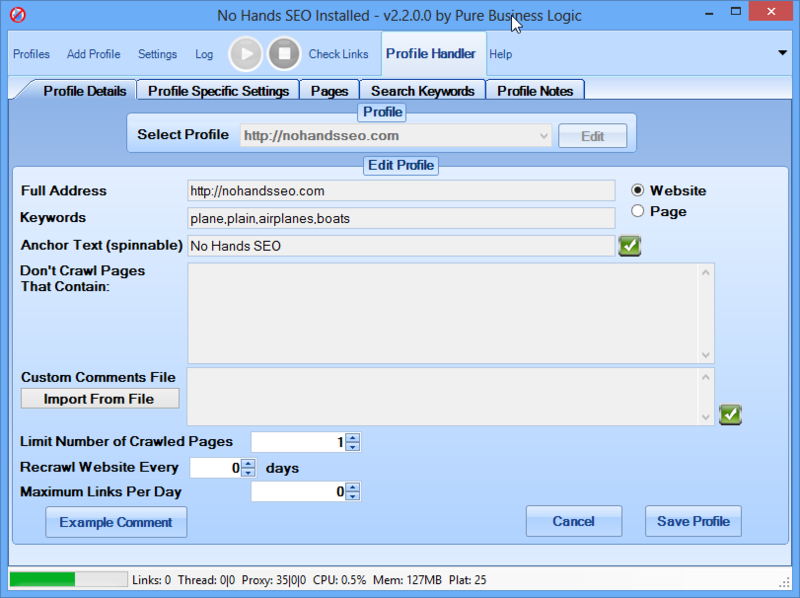 The best part of No Hands SEO is that it will deep link all of your sub-pages. I can assure you that this tool will increase your rankings. I was one of the lucky few who was able to use "No Hand SEO" before the official release. I can honestly say this software is amazing! I have used many automation SEO tools in the past and nothing is as easy to use as "No Hand SEO". 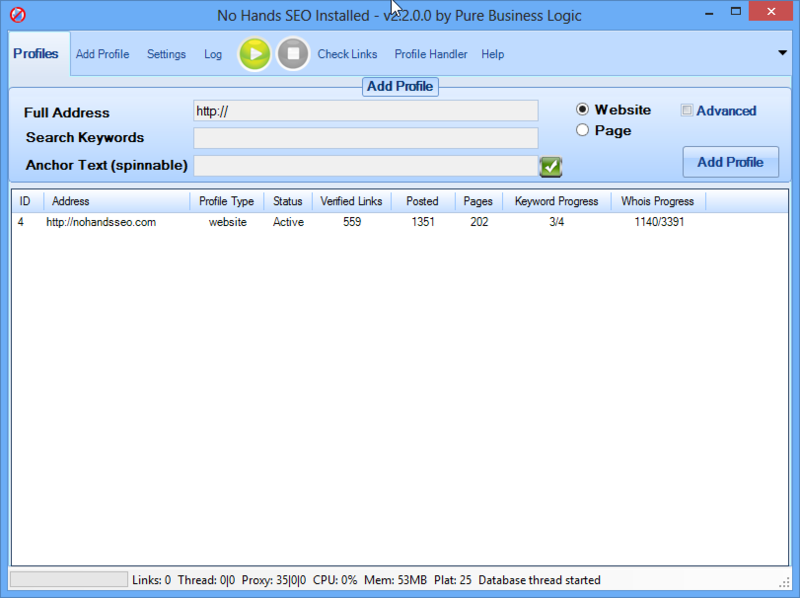 I bought NoHandsSEO a couple weeks back and I built probably thousands of backlinks already and all I can say is that NHSEO is probably the best SEO tool that I bought so far and the service of jimbobo2779 is awesome. Whenever we had ideas for updates or to improve the software he took the time and implemented these feature requests more or less right away. Awesome product and awesome service. If you are on the edge of buying, just do it, you won't regret it. If you need some assistance or have any questions regarding No Hands SEO, you can contact us using the form below or the information on the right side.